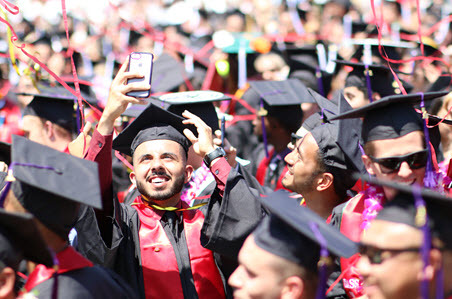 In commencement ceremonies held May 24-25 to honor the largest graduating class in Stanislaus State history, students were inspired by the themes of working hard to utilize the power of diversity and told that their degrees carry the responsibility of improving the lives of all people. Thursday morning’s student speaker, Jacqueline Marcos (B.S., Business Administration) set the tone for the messages shared with 3,437 graduates over three ceremonies. Each of the ceremonies featured a keynote address from distinguished speakers. Lynn Dickerson, CEO of the Gallo Center for the Arts, addressed Thursday’s graduates from the College of the Arts, Humanities and Social Sciences and the College of Education, Kinesiology and Social Work. Thursday evening’s ceremony for graduate students and those receiving credentials was addressed by one of their own, Stan State graduate and California State Student Association President Maggie White, as well as student speaker Lauren Lanum (multiple subject credential). On Friday morning, the graduates of the College of Business Administration and College of Science were addressed by Michael Tubbs, the Mayor of Stockton, in addition to student speaker Teresa Stevenson (B.A., Psychology). Addressing all three ceremonies, Stanislaus State President Ellen Junn urged the graduates to heed the lessons of their heads, hearts and hands as they go forward in life. Dickerson had a 29-year career in newspaper management, including a stint as president and publisher of the Modesto Bee, prior to joining the Gallo Center. She urged the graduates to persevere through the tough times certain to come along in life, and reflected on tragedies in her own life, which included the drowning death of her youngest son. Her personal rebuilding process, including the continuous struggle of putting one foot after the other, taught her to treasure each day, and she implored the students to do the same. White, just prior to receiving her own master’s degree in public administration, called her peers to public service. “You have sacriﬁced and been pushed beyond what you thought were your limits, and you have made hard choices to get to this point,” White said. “This is not the end of anything but rather the beginning of a great privilege — heightened service to others. Tubbs has received national attention for his efforts to put Stockton back on solid footing following a decade-long battle against bankruptcy. And as a first-generation college student, he brought perspective to the responsibility of college graduates to serve their communities. Tubbs spoke to graduates about how the Central Valley experience can be a catalyst to lift up others. Katherine Temnyk (B.S., Kinesiology) received the Geiger-Metzger Student Award for highest undergraduate grade point average. Angela Pimentel (B.A., Political Science) was given the J. Burton Vasché Award, presented to the graduate who displays the highest standards of leadership, service and scholarship, and Anthony Perrello, a professor of English, was honored as Outstanding Professor. To read more about some special members of the Stan State Class of 2018, visit our #StanGrad page.